Gary Miller is the proprietor and winemaker who crafts small lots of wines from purchased grapes. He was a professional chef for 12 years before becoming a winemaker in the Napa Valley. He has worked for La Jota, Martinelli and Robert Biale wineries. 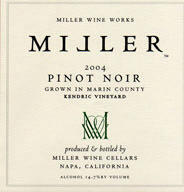 His excellent Pinot Noir is sourced from Kendric Vineyard in Marin County. The wines are sold through the website.